One of the most famous names in the wine world, this small village is renowned for the mainly red Rhône wines that are made here from a large variety of grapes. Lying 12 kilometers east of Avignon, which was the Papal seat, Chateauneuf became the Popes summer residence and naturally its wine, “the wine of Popes”. The castle was built at the beginning of the 14th century and the Popes played an active role in the quality of the wine. Fast-forward almost 800 years and the Papal legacy live on in the famous bottle with the embossed logo of the papal tiara above the crossed keys of St. Peter which is used for all wines from the appellation. 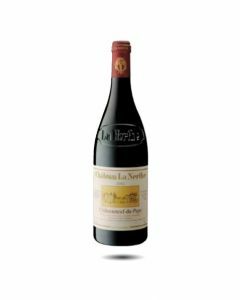 Chateauneuf-du-Pape is located in the region of the Vaucluse in the southern Rhone. During the Tertiary period, 60 million years ago, the Rhone valley was flooded. This was followed by the melting of the Alpine glaciers that created soils full of layers of rocks, pebbles and quartzite. Although there are a great variety of soils in the region, it is the large, washed pebbles that are the region’s most distinctive feature. Chateauneuf is famous for allowing 13 different grape varieties in its blend - Grenache, Syrah, Mourvèdre, Cinsault, Clairette, Vaccarèse, Bourboulenc, Roussanne, Counoise, Muscardin, Picpoul, Picardan and Terret Noir. Joseph Ducos, former owner of Chateau La Nerthe, led much of the work of replanting the vineyards with these varieties after phylloxera and the estate still uses a large variety of old vines today although the predominant grape variety is Grenache with smaller amounts of Syrah and Mourvèdre. There are 320 producers in the appellation who cultivate 3160 hectares of vines, accounting for 14 million bottles of wine, 95% being red. The red wines are rich, earthy wines with gamey flavours matched with oak aromas. They can be quite tannic when young but age well to reveal layers of different flavours and elegance. The white wines tend to be full-bodied and rich with ripe fruit flavours mixed with fennel, almond and anise. The wines match well with country dishes such as stews, game casseroles, white meat in white sauces and aromatic cheeses. The 2013 vintage was harvested very late with a very small quantity of grapes. In spite of this the wine has a very pretty acidity and lots of aromas. Like its red brother, this white Chateauneuf du Pape is made from rich blend of different grapes: Roussance 38%, White Grenache 31%, Clairette 16% and Bourboulenc 15%. The wine has a very bright pale yellow colour with green tinges. The nose is intense with aromas of grapefruit, white flowers and lemon tart. It is balanced by a fine and subtle oak. On the palate the wine has lots of freshness, good roundness, aromatic purity and a long finish with notes of lychees and apricots. A blend of Grenache Blanc 35 % , Roussanne 33 %, Bourboulenc 18 % and Clairette 14 % is used in this blend. The Roussanne grapes are fermented in French oak barrels (1/3 new) and then aged on their fine lees. The other grape varieties are first vinified in stainless steel tanks at cool temperatures and then aged on their fine lees. The result is a pale yellow wine with green reflections; the aromas are expressive with nuaunces of white peaches, brioche and citrus fruit. There is a beautiful freshess on the attack leading to a wine that is quite rich and round with the same flavours of white fruits with a hint of baked apples. The finish is long with a roasted note accompanied by floral tones, then pineapple – all of which are wrapped in a lovely sweetness? A very great white wine to serve with grilled fish, poultry, vegetarian dishes or cheeses. We love the intensity and the finesse of this 2015 vintage with its fabulous aromas of white plums and grapefruit. Made from a blend of Grenache Blanc 35 % , Roussanne 33 %, Bourboulenc 18 % and Clairette 14 %, the Roussanne grapes are fermented in French oak barrels (1/3 new) and then aged on their fine lees. The other grape varieties are first vinified in stainless steel tanks at cool temperatures and then aged on their fine lees. Combining freshness with density, fruit concentration with very pure, organic minerality, this is a very impressive wine which has won much acclaim. It will age well for the next five years and is lovely served with grilled fish, poultry, vegetarian dishes or cheeses. A tiny vintage in terms of quantity but of very great quality with perfect ripeness and great balance. Made from a blend of Grenache 43 %, Syrah 30 %, Mourvèdre 22 % et Cinsault 5 %, the different grape varieties are blended together immediately in the fermentation vats. The winemaking begins with a pre-fermentation maceration and then the fermentation begins thanks to the indigenous yeasts present on the grape skins. The wines are aged in French oak for 12 months, half in barrels, half in large casks. The wine has a dark garnet red colour, nose of black cherry, strawberry, red and black berries with notes of more complex aromas such as cedar and sandalwood. The taste is suave with tannins which are still young but velvety and fresh. Well-balanced on the palate with an abiding liveliness often found in great organic wines such as this. This vintage can already be appreciated when young with its palette of red fruits, spice and freshness. There is also an abiding elegance and concentration here which will allow the wine to show well for the next five to ten years. Regarded as being one of the more modern styled Châteauneufs owing to its fruity expression and purity, La Nerthe sits on 90 hectares of fabulous limestone soil interspersed with large « galet » pebbles. A great year for this domaine, the 2015 is very dark and rich with an intense ruby red colour. On the nose there are intense Syrah aromas of ripe blackberries, freshly ground black pepper, Asian spices. On the palate the wine has beautiful poise and precision, remains fresh as well as rich and opens up on the finish to reveal fruit, herbs and balsamic flavours. This will develop beautifully over the next 10 years, although I suspect that most will not be able to wait that long to enjoy this delicious wine. 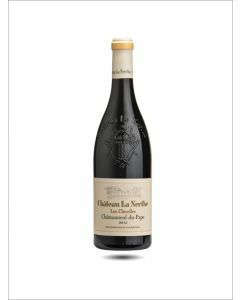 The 2017 vintage joins the 2015 and the 2016 as a trio of exceptional vintages for La Nerthe, one of the oldest and largest estates in Chateauneuf-du-Pape. Thanks to great investments and a great terroir, La Nerthe is at the top of its game and producing gorgeous organic white and red wines at its large domain south-east of the village of Chateauneuf. The grape blend is 55% Grenache, 17% Syrah, 15% Mourvedre, 7% Cinsault, 3% Counoise and the remaining 3% is a blend of the other varietals planted in the vineyard. La Nerthe 2017 is very elegant and composed, fruity and spicy with an abiding freshness. Its drinkability perhaps belies the power and the concentration that this great wine possesses. It seems wonderful to drink now but it could age for another ten years to reveal layers of depth and complexity. 2003 Domaine du Caillou "Les Quartz"
Made from 100% Grenache grapes, this is a stunning wine with a beautiful dark ruby colour, lots of intensity, a fabulous, fresh nose full of plums, red fruit and fine berries; on the palate the wine offers a bouquet of mint, fruit, spice, fine oak but above all what is so striking about this wine is its sweet, suave taste and its elegance combined with lots of persistence. The grapes come from a single vineyard of polished “galet” pebbles and this wine is only released in very small quantities. Delicious now it will certainly keep for another 10 years.